How to import to Ghana? 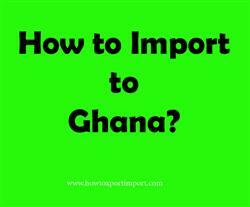 What are the import procedures in Ghana to move goods? Explain about import registration process, cargo movement to Ghana from overseas countries, Import delivery process in Ghana etc. Detail the import methodology in Ghana. This post explains about step by step procedures that need to be finished with Ghana government authority for importation to Ghana. All natural persons or legal entities are approved to conduct export and import process in Ghana. For commercial purpose, a registered trade with concerned license (if required) as per the business and have enlisted in the Trade and Company Register of the country is must for exporting and importing of products from and to Ghana. The importer also required to enroll with the Internal Revenue Service (IRS) and obtain a Tax Clearance Certificate. Then, apply for a Tax Identification Number (TIN) from the Revenue Agencies Governing Board. After then, one can go with import business. The Ghana Revenue Authority (GRA) is the authority for the administration of taxes and customs duties in the country. The Customs Division (CD) under the Ghana Revenue Authority (GRA) is responsible for collection of Import Duty, Import VAT, Export Duty, Petroleum Tax, Import Excise and other taxes. It also ensures the protection of revenue by preventing smuggling. The Customs Division performs agency duties on behalf of other government organizations and Ministries by seeing to the enforcement of laws on import and export restrictions and prohibitions. The efficiency of the Customs Clearance process is depend on having the valid documents, the accuracy of the information provided in the documents as well as the promptness in submitting the documents and filing the necessary applications for the Customs Clearance. The importer should make sure that they made all of the correct import documents that are required to get clear the customs formalities, satisfy all compliance and regulations. This post explains about different phases in import process that every importer needs to go through in Ghana. Import registration procedures required in TEMA. Import Licence process in TAKORADI . Process to import to SEKONDI . Requirements of registration to import to TEMA. Registration requirements in TAKORADI to import. What should I do to import goods in TEMA. How to get import customs permission in SEKONDI. How to import to TEMA? Formalities for import to TAKORADI. Procedures to import to SEKONDI . Need to import to TEMA. Procedures required to import to TAKORADI. Requirements to import to SEKONDI Clarifications to import to TEMA. How can I import to SEKONDI. What should I do to import to TAKORADI. Procedure to get customs clearance to import in TEMA. Mandatory process need to complete import in TAKORADI. Import documentation in Tamale port customs. What are the documents required to import in Kotoka. What are the import document processes need to carried out with Tamale customs. Explain to import to TAKORADI. Information to import to TAKORADI. Step by step process to import to TEMA. Methods to import to SEKONDI. Guidelines to import to SEKONDI Please guide to import to TEMA.